My first half marathon was at Walt Disney World in 2011. At the time I had never run such a distance before and led me to my desire to run marathons, but it led me to running five more Run Disney race weekends (including a Goofy and the inaugural Dumbo Double Dare). I decided to take 2014 off from Disney races in order to run the Berlin Marathon in Germany, but when I heard there was going to be a Star Wars themed race weekend, I had to make my return to Disneyland for the cross section of two of my passions. When registration time came, I saw they were offering the “Rebel Challenge” to run a 10k on Saturday morning and a half marathon on Sunday morning, so I had to opt for it. The down side to this is that I was going to be waking up for 5:30 race starts on successive weekend mornings. In previous races, I had been able to do a half marathon in under two hours, which put me in the first corral for both races and now I had to be there by 5:30 to start running with the first group of runners. For the 10k, I figured out when I needed to be up to get ready and be at the start on time – and I really did figure it out pretty close. I got to the corral just as the nation anthem was concluding and was able to move up a little bit before announcer Rudy Novotny sent us on our way. The race started and we were on our way down the narrow road on our 6.2 mile journey. We headed north and ran onto the local roads, making a right to head east above the parks. It was here where the roads opened up and we were able to spread out and head south until we turned around and headed back onto Disneyland property and the backstage. Circling around until we came onto Main Street USA, we turned west and went around the Magic Kingdom and back to the backstage to head for California Adventure, including a run through a tunnel where they played Darth Vader’s breathing and his voice encouraging us. We emerged in the neon lit Cars Land and worked our way around the pseudo Hollywood until we came out and headed for the Disneyland Hotel parking lot, where our 10 kilometer adventure came to an end. I finished the 10k in a PR of 52:17. I had beaten my time at the 2014 Queens 10k by about 5 minutes, and I had done it in a Boba Fett running shirt. With it completed, I spent a day poolside and preparing for the half marathon. Knowing how close I was to my start time when I arrived, I woke up a half hour earlier and had more time to prepare in the corral before Rudy sent us off again. Like the 10k, we started by heading north, but this time we looped back by the end of mile one towards the backstage of Disneyland. The narrow roads made it tough to space out between the runners, to our detriment, but it was a bit better once we finally got to Main Street USA a mile later. Moving through the park and seeing the Star Wars characters made it worth waking up at 4am as we ran through. More characters greeted us along the streets of California Adventure until we made our way out at about four and a half miles. It was there that we finally left the Disney properties and headed south on Harbor Boulevard for a couple miles before heading west. Assorted marching bands were scattered along the course, but ultimately it was fairly boring until around mile 9, where the 501st Legion were out cheering in their custom armor and costumes of various Star Wars characters. Seeing them cheering the runners on was reenergizing before heading back east for a mile and a half. Mile 11 to 12 ran a mile up Harbor Boulevard, and let us run on the opposite side of the street of the runners who were around mile 5. The camaraderie of the runners running opposite each other and cheering each other on was inspiring, as we all were on different parts of our 13.1 mile experience. Turning left at the Anaheim Convention Center took us on the final mile back to the Disneyland Hotel parking lot and the finish line. 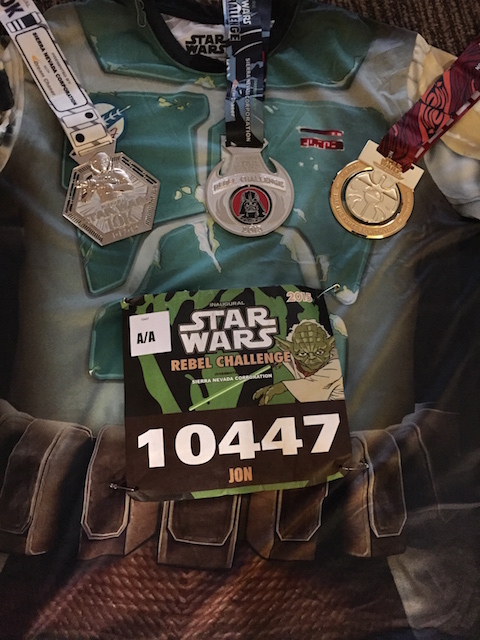 By finishing the Star Wars half marathon in 2:08:26, I had finished my 19.3 miles and the Rebel Challenge. It felt good to return to running in Disneyland surrounded by other Star Wars fans in costumes and running attire, as well as the Star Wars characters cheering us on and available for photographs (which I opt not to do). Now I just need to do a half marathon in Walt Disney World to complete my Coast to Coast.